After several months of testing, discussion, coffee, more testing and more discussion, the 2012 Cybils Award winners have all been chosen. I’m pleased to announce that the winner of the Book App category is Dragon Brush! Many congratulations to Dragon Brush, by Small Planet Digital, and to all the other excellent finalists. 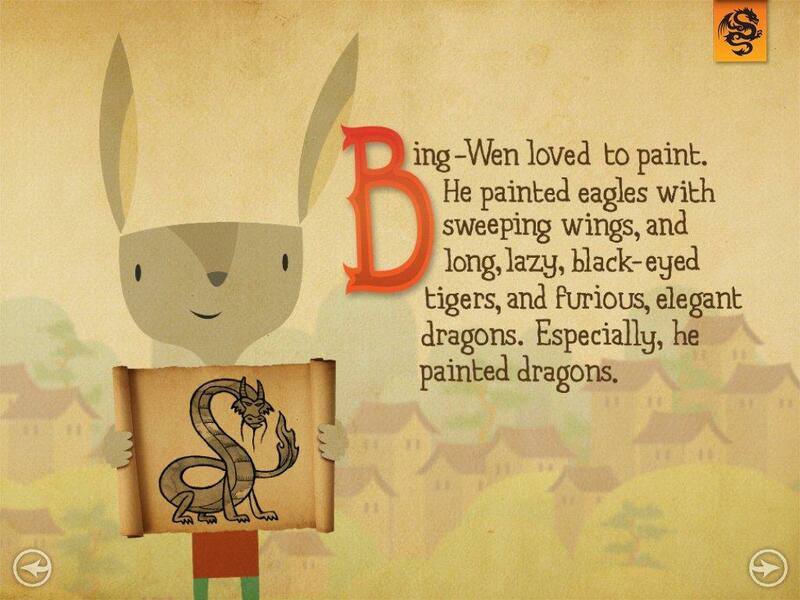 Dragon Brush tells the story of Bing-Wen, a young boy (here, a rabbit) from China. He loves to draw, but coming from a poor family he can’t afford paints or paper. He helps an old woman in the street one day, and to thank him she gives him a magic paintbrush which makes his drawings come to life! When he tries to use it for himself, it doesn’t quite work out as planned, but soon he is using it to help both his family and his village. Then the evil emperor finds out, and tries to force Bing-Wen to use the brush for his own ends. 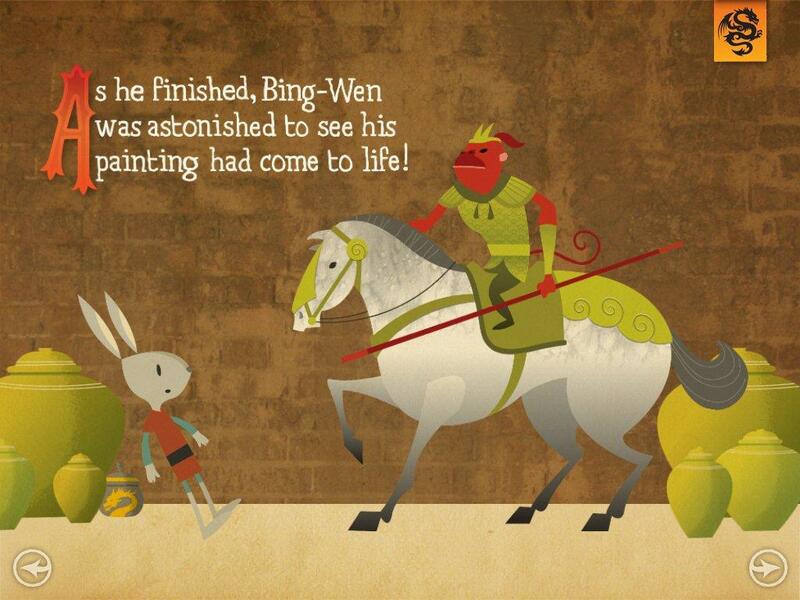 But quick-witted Bing-Wen finds a way to outsmart the emperor, using just the paint brush and his imagination. This app is an excellent model of how to create an immersive storytelling experience on the iPad. The real star of the show is the way you draw across the screen with your finger to reveal the pictures, and then watch as they magically come to life. This is a great use of technology to add something special to the story. You can also find magic paint pots hidden in the pages, which can then be used in the extra Painting section after reading the story. There is just enough detail and interactivity to draw the reader into the action, without it being too busy. My children don’t press randomly on the screen to see what happens, because the text and interactions are so well integrated. The narration and music are unhurried and help to pace the story very nicely. John Solimine’s illustrations are beautiful; the colour scheme and font also add to the folk tale atmosphere. Finally, it is so simple to use (always a must with young children!) – very intuitive, smooth and easy to navigate. My children and I have been so delighted with this app, we have been returning to it again and again. With most apps, there is one element which is not quite up to scratch, or niggles a bit, but I honestly can’t think of something I would improve on this one. Dragon Brush was my favourite of the Cybils finalists, and so I was really pleased that the all judges agreed that this was to be our winner. 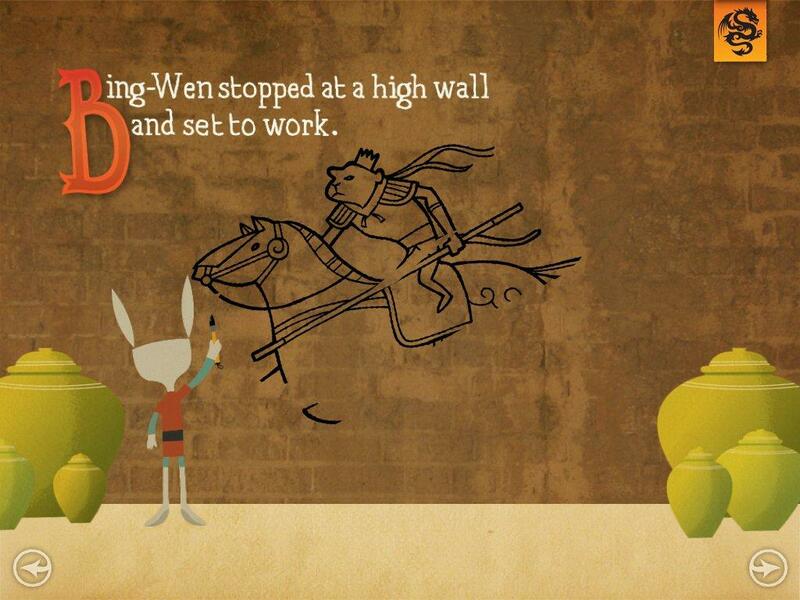 Dragon Brush is an excellent app – a wonderful retelling of a Chinese folk tale, executed brilliantly, and making full use of technology to serve the story, not distract from it. A well deserved winner! Dragon Brush, developed by Small Planet Digital, compatible with iPhone, iPod Touch and iPad. Available from https://itunes.apple.com/gb/app/dragon-brush/id525049909?mt=8 priced at £1.99/$2.99 at time of writing. ← Comic Relief? there’s an app for that! Great to hear about the winner in your category! This looks brilliant! Will be downloading it today and spreading the word. Actually, I shared your blog on my Story Seekers Facebook page yesterday as I’m constantly recommending the apps you review and thought it might be easier for people to just go straight to your awesome site! Oh thank you, that’s so kind! I must find your Facebook page.